Another day, another Overwatch video. Seriously Blizzard, how many characters have you got? Oh, 14. Well that'll keep us busy for a while then. Today, it's the turn of Torbjörn, an Engineer-like character with an upgradable turret. 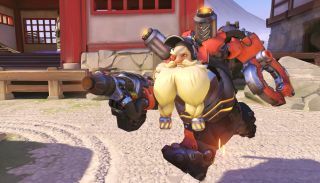 In true Engineer style, Torbjörn uses scrap collected from dead enemies to build and upgrade his turret. His other ability lets him throw down armour cores for allies to collect, and his ultimate overheats his suit for increased armour and a buff to attack, building and repairs. Blizzard's FPS will go into open beta this autumn.